There are a few things I loved right away, before even trying out the diaper on Gabe. First, the extra set of rise snaps. Most One-Size diapers have 3, sometimes 4 rise settings, which is sufficient after the "newborn" stage of diapers, or after 8-12 pounds depending on the brand. Booty Buns are a true OS diaper, from the feature of 5 rise settings. Their pocket diapers will fit most babies from 3 pounds up until 45 pounds. Yes, you saw that right, they can fit already at THREE POUNDS! Of course the other immediate favorite feature of mine is the suede-cloth inner. There seems to be a fine line in the world of pockets between mamas who love fleece and those who love suede-cloth. Of course there are some who love both, but I'm a suede-cloth lovin' mama! For me, it washes up so much easier, as in, it rarely holds onto stains. It still feels so soft and smooth after many washes. Fleece always gets so pilly for me after just one or two washes, and pockets with fleece inners always seem to wick for us too. I've never had wicking with a suede-cloth pocket. Booty Buns also includes a super soft cloth wipe, and a nice smooth flannel liner with each of their diapers.Both were so soft to the touch (and of course, to my little mans' bum), and seem to hold up nicely. The wipe has made it into my regular wipe stash, and the liner is my single favorite liner we now own. I love the idea of fleece liners, but I hate that much bulk in a pocket. I also love the idea of disposable liners, but I think they are far too thin to be using with something that can bond to your diaper make it repel. I never would have though to use flannel! Genius! Booty Buns recommends using a flannel liner to help clean up when your baby poops, and the flannel is said to be a nice barrier for babies who may be sensitive to suede-cloth. 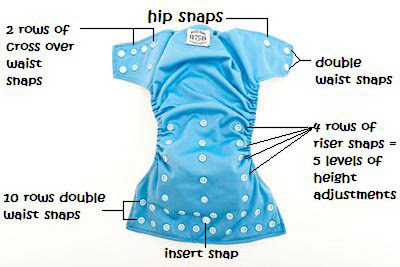 There are 2 inserts included with the Booty Buns OS Pocket, both microfiber, both have a snap to snap it into the top of the diaper to prevent shifting, but one is a newborn size while the other is more medium size. Because of our shared laundry room, I usually end up with stinky microfiber. I tried these inserts a few times, and while they worked just fine, I have swapped them out for an infant-size prefold. The microfiber is more trim, but I feel like cotton washes up a bit better. Booty Buns is offering one of my readers the chance to win their very own Booty Buns cloth diaper in their choice of color (I will pay the shipping). Please enter using the Rafflecopter form below. Last year I contacted Dee of DeeTergent after hearing about her products on Diaper Swappers. I waited for a new batch to be made up and she graciously sent me a bag of Monkey Farts detergent. I tried it out over the span of a couple months on cloth diapers, and regular laundry, including Jer's work clothes. It seemed really good at first, but after a few washes I noticed an odd funky smell in our "clean" laundry. I loved the smell of the detergent. It was very fruity, and filled our apartment's laundry room, and even lingered with our laundry for a day or so afterwards, but things just had an unclean smell to them underneath that delicious banana smell. I tinkered with our wash routine for over a month and then Dee offered to send out a new bag. She explained that they did make a few changes to their formula around the time that my original bag was sent out, and wanted to make sure I was using their best product. It was about a month later that I received a new bag, in Raspberry scent! Yumm-o! I immediately noticed that the texture of the new bag of DeeTergent looked different. When I scooped it into our first load of laundry, it looked like it dissolved a little quicker too. Again, the delicious scent filled the laundry room, and lingered with our laundry. I loved it! After a couple loads I could really tell this batch was cleaning better. Our clothes smelled better, and Gabe's diapers came out looking cleaner and much more "fresh" smelling. It rinsed clean in one wash too. It's been a very long time since I've seen a lower sudsing, clean rinsing detergent clean so well! I should note as well, that after I got a routine down working smoothly with the new bag of Raspberry DeeTergent, we were washing with hard water in our apartment building. A couple weeks later we moved (which is in another blog post) to a townhome, that also has community laundry, but also has a water softener running through the buildings, as well as the washers. So I got to try this DeeTergent out on a couple types of water, and I was amazed at how well it worked under different circumstances. I've enjoyed trying DeeTergent so much, that I'd love you all to try it out too. Dee is offering all readers of my blog a 20% discount by using the code: CHISFAN, which expires on 6/5/2012. You can use your discount code on DeeTergent's website HERE. Don't forget to connect with DeeTergent on Facebook and Twitter. Let her know you found her here!